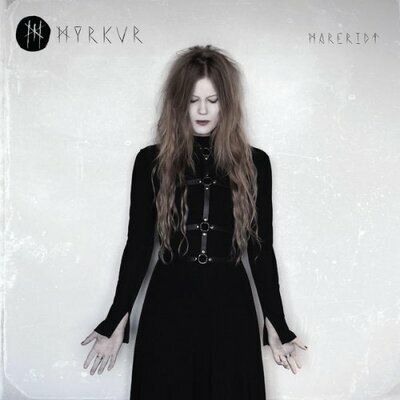 “Yes, destroy evil with evil,” Amalie Bruun sings in her native Danish at the beginning of “Ulvinde,” her latest song as Myrkur. In the accompanying music video, Bruun crawls through mossy roots and stumbles over frigid rock outcroppings. Occasionally, she spits up blood. It’s rough stuff, lyrically and visually, but Bruun’s singing voice is beautiful. Where most metal singers either croon or belt, she rings. Her delivery, full of sustaining notes that subtly decay, is reminiscent of choral music — with all the ritualism, religiosity and awe it entails. Bruun can scream, too, and the shots of her engaged in a commanding, full-throated shriek entangle with shots of her bloody mouth. The juxtaposition of those forces — Bruun’s two voices, distorted guitars and violent images — gives her work a vital charge. “Inner/outer demons and mental/physical assault is something I’ve had experience with and this has caused me nightmares, which has led to this song and video,” Bruun tells NPR. She even named her upcoming second full-length album Mareridt, the Danish word for nightmare. At times, the record makes for a harrowing listen. Bruun composes in minor keys with hummingbird-speed guitars, as many Scandinavian metal acts have before her — which isn’t to say that people who love black metal always love Myrkur. Bruun is a polarizing figure even though she follows many of the genre’s tropes to the letter, including its fetish for folklore and pristine landscapes. Bruun’s music rejects the trappings of modern life in favor of a romanticized, pre-Christian European idyll. “‘Ulvinde’ is a song about escaping into the wilderness and the past,” she says. “The song is partly about longing for a place in nature in peace away from the ‘real’ world, a world that I often feel I cannot and was never meant to function in.” Bruun excels at this task in particular thanks to her voice, which at times recalls other European heritage-music popularizers like Loreena McKennitt. Go into the wild, take an evil sound, bend it to a positive end.